This boxed full version of IK Multimedia SampleTank MAX is a virtual instrument comprising the entirety of SampleTank 3 and 22 additional instrument collections. This virtual instrument features over 52GB worth of sound samples organized into over 4600 instruments in 21 categories, giving you plenty of drum/percussion-loops to boot. 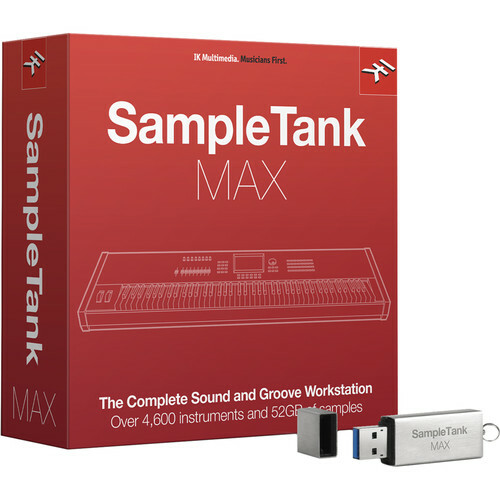 Instruments emulated in SampleTank MAX range from acoustic/electronic drums to acoustic/electric basses, guitars, pianos, strings, woodwinds, vocals, percussions, loops, and more. Additionally, SampleTank boasts over 7400 drum, percussion, and full construction kit loops, as well as an excess of 3500 MIDI patterns to help inspire your compositional pursuits. For sonic manipulation, SampleTank MAX features 55 integrated effects, including EQ, compression, guitar amp modulation, reverb, delay, and filters—of which many are derived from IK Multimedia's T-RackS and AmpliTube software. Its interface is composed of Play, Mix, and Edit environments, providing you streamlined locales for sound selection, editing, and mixing capabilities. The software can run as a standalone program and supports 64-bit AAX, VST, and AU plug-in formats.